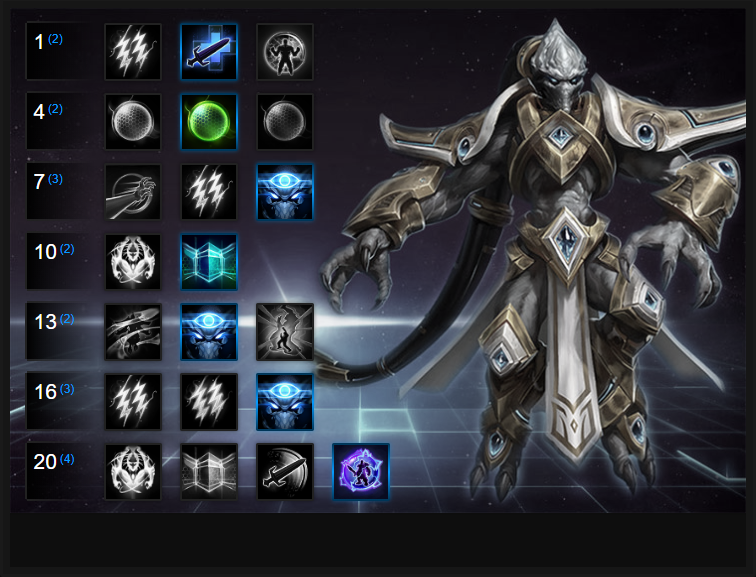 In this Tassadar Build Guide, we provide an overview of his strengths, abilities, talents and matchups. Tassadar is a ranged support Hero that can provide powerful shielding and vision to his allies. His Heroic abilities bring damage or utility and this, to some degree, makes him flexible. Although he isn't a brilliant solo Support Hero, it can be done. For his shielding alone Tassadar is still picked regularly in the competitive scene. The Mr Play bonus offer is also picked regularly. The fact he can provide shielding, but also uncover areas of the map allows your team to adjust their tactics against the enemy and react accordingly. Combined with two warriors, this mix allows for a team with high sustain without necessarily needing a dedicated healer. I will add however that to play Tassadar well takes a lot of skill and you need to know exactly which Heroes to shield and when. His recent rework has changed him significantly and I wouldn't neccasarily say for the better. Oracle (Trait) - Oracle allows Tassadar, every 30 seconds, to reveal an area around him. It’s rather large and uncovers anyone hidden in smoke or bushes. Best of all, it also reveals cloaked enemies such as Nova or Zeratul. It’s invaluable at providing your team with vision before engaging and should be used as often as possible. Just be sure to use it when you think enemies are nearby. Using it too early will waste its potential for predicting the enemy. It's also worth nothing that as part of this trait, Tassadar gains a passive slow on his basic attack (20%). Plasma Shield (Q) - The primary Tassadar ability, Plasma Shield provides himself or an ally with a shield. It scales well and can allow your team to survive for much longer, especially if you have another Support with you. It’s also important to note that by default allies gain 20% life steal from basic attacks when shielded so the likes of Valla, Raynor and Tracer can gain a reasonable rate of healing. Be aware that Plasma Shield can only be cast on one target at once (by default) and has an 8 second cooldown - it's important to predict incoming damage when you cast it. Psionic Storm (W) - Your primary damage ability, Psionic Storm creates a small AOE pool of electricity. Lasting for 3 seconds, its damage isn’t amazing but it provides useful area denial. If enemies remain in the pool, they also take increased damage. It's mana cost is relatively cheap and its cooldown low so don't be afraid to drop it to pressure an enemy, soften a minion wave or to deny an objective interaction. Dimensional Shift (E) - Probably the best escape ability in the game, Dimensional Shift allows Tassadar to turn completely invisible and invulnerable for 2 seconds. Not only this but he gains a 25% movement speed buff for the duration; it doesn’t should like a lot, but its duration is long enough that you’re almost guaranteed to escape. Be sure to reposition yourself so that when you are visible again, you're in a good place to reapply shielding to your team. Archon (R) - His “offensive” Heroic ability, Archon allows Tassadar to transform. Gaining a significant shield and basic attack damage boost which splashes to nearby enemies, whilst slowing: it’s a good Heroic to take if your team really lacks damage. Best of all, it lasts 10.5 seconds and you can still use all your standard abilities during it. Although I still think it's weaker than Force Wall, it can help if your team is short on pressure. Force Wall (R) - I argue it’s his best Heroic ability, Force Wall creates a barrier in front of Tassadar. You can place it anywhere and its width ensures foes will struggle to move around it. At that point, it’s your team's opportunity to pounce on them and finish them off. Best of all, Force Wall can also be used defensively when you’re retreating to block enemy players from reaching you. Should you take Force Wall, it lasts 2.5 seconds by default (more than enough to kill a player) and increases your basic attack slow by 10% (up to 30 from 20). By default Tassadar deals terrible damage and also has fairly poor sustain. Taking Templar's Will allows him to not only dramatically increase the damage on his basic attack (by 125%) but it also allows him to regain 8 mana per second his Distortion Beam is active, while also increasing its range by 1. The only catch is that you need to complete 60 seconds attacking enemy heroes to gain all these benefits. The quickest I've completed this in is 2 minutes: it's a pain-free, fantastic talent. With Khala's Embrace, players affected by Tassadar's Plasma Shield will see the life steal component increased fto 75%. With a basic attack heavy team, this is enormous and provides amazing amounts of health return, especially if you have Heroes capable of rapidly attacking. Oracle is key to Tassadar's play as vision is so important in allowing him to shield on time, predict who's coming and generally give his team Battleground awareness. Mental Acuity is a quest that lowers the cooldown of Oracle by 3 seconds for every takedown, up to a maximum of 15 (halving its cooldown). Not only this but on completion it also increases the sight range by 100%. This is huge and allows you to not only see for miles, but use it far more often. Archon provides Tassadar with utility and damage. Transforming him into a giant robot, Archon allows him to not only deal high damage, but also gain a fast attacking basic attack which slows, alongside a free shield. Best of all, his basic attacks in Archon splash allowing him to deal serious pressure while still being able to use his abilities. Building on Tassadar's talents, Adun's Wisdom reduces his basic ability cooldowns by 50% when Oracle is active. Considering Oracle lasts for 5 seconds, it's more than enough time to boost your Plasma Shield and Psionic Storm output - never a bad thing. Just be sure to use Oracle just because you cast your first shield. Variable: Nullification allows you to reduce the damage of one target by 75% for 3 seconds. It's amazing against assassins such as The Butcher or Thrall or even a warrior that's getting too close for comfort. Also fantastic if you slow them at the same time with your basic attack, while using Force Wall to separate them out from their team. Focused Beam allows Tassadar's basic attacks to deal 1% of a heroes maximum health as damage while Oracle is active. While it has a short duration, with Templar's Will completed it allows Tassadar to deal massive damage to a single target as long as he can maintain contact. Prismatic Link allows Tassadar to spread his basic attack to 2 additional targets for 40% of the source damage. Combined with your level 1 talent, this AOE potential not only deals a lot of damage but also ensures those hit by the richochet are slowed. It's a huge amount of damage and crowd control that most teams can struggle to deal with. This list of tips and tricks are just a handful of things we think will help your Tassadar play. We'll continue to add to the list as required and if you have any tips you'd like to share, let us know in the comments below and we'll place them here. 1. Always try to use Plasma Shield on the target most likely to take damage. Protect your front line or your squishy assassins. 2. Try to save Force Wall for two key moments: escaping or trapping low health enemies from escaping. 3. Only use Dimensional Shift when low health, or to reposition in a fight so that you can stand somewhere safely. 4. Because Dimensional Shift makes you invulnerable, it’s perfect to use when you’re about to take huge damage. 5. With practice you can learn to see Nova and Zeratul’s cloak. Be sure to use Oracle when you see them nearby. 6. Always use Oracle before engaging or using an objective so you don’t get ambushed. 7. Late game when your quest is half way to completion you can use your Plasma Shield on an ally and if it disappears, 50% of it will remain permanently. Try to do this on all your team as much as possible. 8. Psionic Storm is great for ranged poking an enemy team due to its duration and it being an AOE field. 9. You can use Plasma Shield to protect structures when under attack. 10. Towards late game Tassadar has strong utility if you've taken Nullification, Force Wall and Shield Battery. 11. Even though you can shield yourself and turn invisible, don't think you're invulnerable. Some Heroes such as Valeera are relentless and unless you've a warrior to protect you, you'll soon be in trouble. 12. Your basic attack causes you to stand still (as a turret) and its damage is garbage. Try to position yourself in a team fight so that you can keep it on an enemy without having to constantly move (it's more difficult than it sounds). 13. You need to constantly rotate lanes to maximize your level 1 talent. Start at mid, then move top (or bottom) unless the map is particularly large (Warhead Junction) at which point it's often best to stay put.